Here's some of the new packs I got from Seed Savers Exchange the other day. The are a rather nice place to get seeds, I might add. They had missed a pack of spinach seeds in my original order and just sent it to me today free of charge and I didn't even have to ask! Plus, they have a HUGE selection of the most exotic heirlooms. I found them when I was looking for my "tiny melons" which looked exactly like tiny watermelons in every way, but turned out to be Mexican Sour Gherkin cucumbers. Anywho, they're good. Give 'em a try. And that's not all, I got lots more - stay tuned! Update! 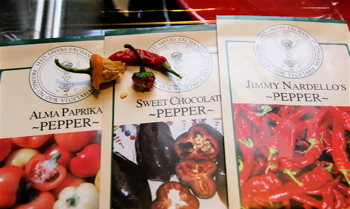 The first pepper up this year was............The Alma Paprika! Congratulations to you! How long do seeds keep? That's what I was wondering as I pondered what seeds to order this year. I've got lots of bean and pea seeds left from previous years, but I noticed they didn't germinate too well last year. Is that because they're no longer good? And what about all of my beloved tomato seeds? I mean, you get so many to a pack that you never use them all in one season unless you have a whole farm. I've just got a little secret farm, so I went searching for an answer. It also depends on how they were stored. It's best to store them in a dry, cool location away from light - however mine always seem to end up out on the 3 season porch every winter where it gets below zero for a bit every year - way colder than "cool". But last year I had some tomato seeds from 5 yrs ago germinate quite well, so I guess it all depends. You can check the viability of your seeds by placing several out on a few layers of moist paper towels, roll up so that the seeds don't touch, and enclose the bundle in plastic wrap so it doesn't dry out. Place in a warm bright location (65 to 70 degrees or so) but away from direct sun. Check the seeds every couple days, until you reach 2 weeks. If you put 10 seeds in there for instance, and 3 germinate at the end of 2 weeks, you'll probably have a 30% germ. rate. Of course then you just wasted 10 seeds, so I usually just go with the less scientific -sow more with older seeds strategy. No matter what, I always end up with more seedlings than I can use anyway.